If Los Angeles area businesses have only 7.77% of their board seats held by women (according to a recent survey by the non-profit, women's membership organization, NAWBO-LA), what does that mean? Is it good? Is it bad? How do we know? In order to measure LA area business performance and set attainable goals, we need to know how our the public companies in our community stack up in comparison with other states or urban areas. © 2005 by Champion Boards. All rights reserved. Los Angeles' performance is the red bar, to the far right -- just a little better than the top Georgia businesses in terms of women as a share of board seat holders. Not a good performance. The average size of the boards of directors of L.A. area top corporations is 7.7 board members -- quite small. The apparel industry has the highest share of women on boards: 15.5%, followed by health care at 14.7%, and insurance firms at 11.5%. 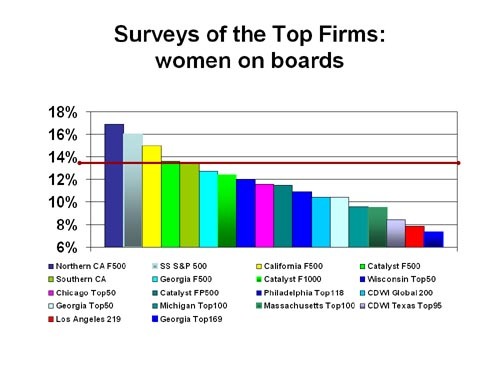 The Fortune 1000 firms listed in the survey averaged an 11.7% share of women on boards -- suggesting that if it had not been for the big firms, LA's women on boards profile would have been far, far worse. In fact, without these firms, LA's average drops to under 7%. The construction/engineering professions averaged 10.5% -- ahead of the financial sector (9.2%) and real estate (8.8%) where women represent a large share of middle and upper management. Technology firms have a poor women on board performance: communications - 0%, computers/peripherals/electronics - 3.8%, Internet - 3.0%, and software - 2.9% even though women represent a large share of consumer electronics decision makers. A Good Beginning. . . Yes, we know that women are under-represented on boards of public companies –- Catalyst has been telling us this for over a dozen years. In the past year, the number of women on public boards actually has declined further. Just this month, Georgia reported another drop in the share of women on their top 100 corporate boards. But WHY? First, because boards themselves are changing. Boards are getting smaller in response to Sarbanes-Oxley expectations: CEOs are being told to limit their board roles, boards are instituting age and tenure limits, and shareholder activist groups are insisting on fewer interlocking directorships. Mergers and acquisitions among area firms and firms leaving California for more business-friendly markets are cutting back on CA-based women on boards: Tenet, WellPoint, Flour, Knight-Ridder are just a few examples. Boards at smaller firms (the Fortune 500-1000 firms) have fewer board members because corporations just starting to work with boards need to take small steps in those directions. But why are WOMEN not pursuing boards of director roles? In many cases, it's because women continue to believe too many myths about boards that simply are not true. “Good ol’ boy network.” Does this explain why women have not responded to the tremendous growth in demand for independent directors, and the associated rise in director compensation, in response to Sarbanes-Olxey requirements? “Recruiters.” Do women know the facts about how boards assess their director candidates’ performance, how they determine their needed skill sets, how they solicit candidates for board roles, and how boards of directors actually recruit new boardmembers? “The non-profit board route.” Does working for free, volunteering, or soliciting charitable contributions really qualify one to perform adequately in a for-profit-oriented environment? And, when women on boards of directors -– especially women on the NOMINATING COMMITTEES of boards of directors -– actively pursue more women on THEIR boards of directors, then we will know we have begun to make real progress in this area.